Built to heavy duty industrial standards, the PowerMaster series makes cleaning loads from 200lbs. to 2000lbs. as simple as pushing a button. Housed in sturdy 10-gauge steel, these parts washers provide electro-mechanical agitation, moving the load through 138 vertical 4-inch strokes per minute. This powerful washing action cleans inside and out - removing chips and particles from blind spots. You gain speed and efficiency that other cleaning methods can't match. PowerMaster parts washers are available with electric heating options for use with Degreasol aqueous solutions. 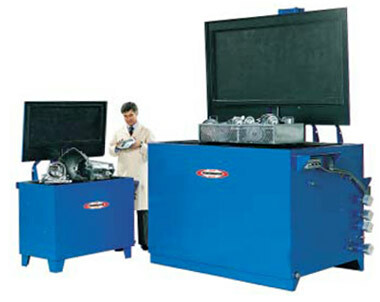 Non-heated models are also available for use with Degreasol to remove oil, grease, and dirt. Castings, dies, weldments, engine blocks, cylinder heads, large parts and small - whatever you need washed - can be incredibly clean with a PowerMaster. PowerMaster's patented Air Rise system makes operation safer and easier than ever before. With simple inputs on the control, the Air Rise system automatically lowers the work load into the immersion chamber and at the same time closes the tank cover before agitation begins. When the cleaning cycle is over agitation stops and the cover opens automatically while the load rises out of the solution. With a PowerMaster parts washer you can ditch the cables, winches, pulleys and dangerous manual lifting to remove parts from the solution. The Air Rise system ensures operator efficiency, energy conservation and a safer workplace.